Lost in a thunderstorm over southeastern Australia, Captain R.D. Parmentier and his crew were desperately trying to find a place to land the big DC2 airliner. They were just a few hundred miles from the finish of an epic 11,300-mile race from London to Melbourne and the storm had rendered their communications equipment useless. While radio operators on the ground tried in vain to reach the aircraft, a mayor in a small town had an idea as bright as the lightning flashing in the sky. He dialed up the city's engineer and asked him to toggle the city's lights in morse code to spell out a message: A-L-B-U-R-Y. The town's name. It was the plane's only hope. Melbourne was ready to celebrate 100 years of existence in 1934 and wanted a gesture grand enough to mark the city's existence. Taking advantage of the sudden leap in aviation technology, they decided on an air race from the old center of power in London to Australia's biggest city. As a prize, the chocolate magnate Macpherson Robertson put up $75,000 ($1.3 million inflation adjusted) from his candy company and the MacRobertson Air Race was announced. The significance was not only the great distance, but also the transformation of Australia as more than "the vast land over the edge of beyond" as one newspaper put it. Planes would all take off at the same time and have to stop at five designated points along the way (Baghdad, Iraq; Allahabad, India; Singapore; and Darwin and Charleville, Australia). There were no rules about the size or type of plane, only a requirement that the pilots fly the whole race from beginning to end and that the planes meet certain safety standards. Despite the safety equipment, Lloyd's of London gave the pilots a 1-in-12 chance of dying. Around 64 teams planned to enter, but just 20 planes made it to the start line on October 20th, 1934. The favorites were a pair of De Havilland DH.88 Comets — sleek twin-engined planes designed especially for the race. The plane's narrow cockpit held just two pilots in tandem. At the other end of the flying spectrum were a pair of passenger airliners. Two American pilots would be flying a Boeing 247-D and a crew of four from Dutch Airliner KLM would be in the even larger Douglas DC-2. To make things more interesting, the KLM plane would be delivering mail and carrying passengers on their trip! Sir MacPherson Robertson's Message on ABC "Dear friends early yesterday morning before the sun had peaked over the horizon to disperse the mists enshrouding the Mildenhall Aerodrome in Suffolk; the competitors of the MacRobertson International Air Race were awaiting the signal to start on the epic flight of 11,323 miles. Never in the history of aviation has there been such a line up of aviators and never in the history of the world has there been such an aerial contest." Under guidance from Captain Parmentier, the KLM DC-2 — nicknamed Uiver (Dutch for "Stork") quickly became a frontrunner. It battled with the British Comet of Captains Scott and Campbell-Black all along the way, using its superior reliability and comfort to keep up with the faster (and not passenger-laden) aircraft. Other competitors crashed (two died) or experienced equipment failure, but the big metal aircraft kept on going. On October 23rd at 3:33 pm the Comet managed to take the crown in the overall "Speed" category, leaving the Uiver and it's crew the chance to win in the "Handicapped" category, which took into account the size of the aircraft using a formula. All the Uiver crew had to do was cross the relatively short distance from Charleville to Melbourne and keep the other competitors behind them. But bad luck struck in the form of a thunderstorm just 200 miles from the finish line. It was night and, lacking visibility and functioning communications equipment, the plane drifted hopelessly off course. Signalers for the Royal Australian Air Force desperately tired to contact them, but nothing was working. Calls went out over the radio for help and railway stations turned on all their signal lamps. Navy ships turned on their spotlights, probably to let the aircraft know if it had drifted too close to the ocean. 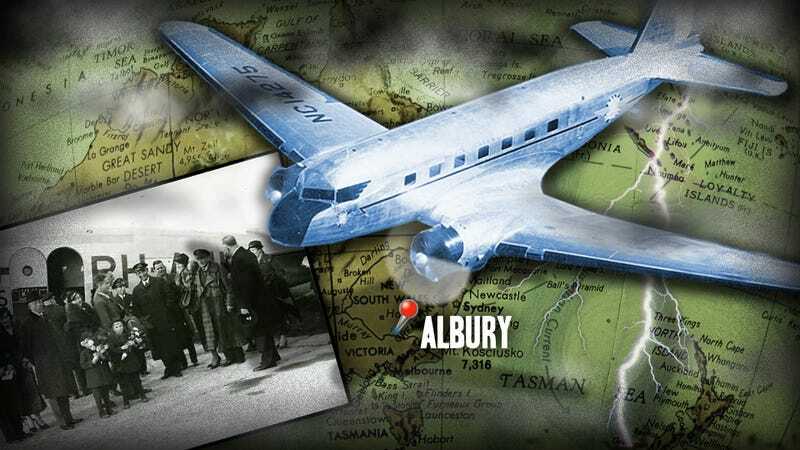 The citizens in the small hamlet of Albury heard the planes engines overhead and assumed it was en route to Melbourne. But the plane didn't leave. It kept circling the area. Aware of the danger various local authorities and radio announcers hatched a plan. The city's Chief electrical engineer Lyle Ferris was sent to flash the city's lights in morse code. An Alderman asked anyone with a car to come to the race course to create a circle of headlamps. Despite the rain everyone who could help turned out. It was a world-wide event as wireless radio communication meant that listeners between Australian and Holland could follow along as the town made its desperate rescue attempt. Amazingly, the crew saw the flickering lights and realized it was morse code. Because of the weather they couldn't read the message but they saw the circle of lights at the race track and, with a lot of skill, were able to land the aircraft. The same rainstorm that kept them from finding Melbourne helped muddy the ground enough to allow the pilot put the plane down without going off the short race track. When the door to the plane finally opened one of the crewman came out and asked Is this Melbourne?. One can imagine the relief of everyone involved and the laughter that ensued when the question was asked. At sunup the plane seemed hopelessly stuck but everyone was alive. Not content to let their guests down, the City of Albury once again rallied and plans were brought in to help unstick the big metal aircraft. Everything in the plane that didn't need to go (including passengers) was stripped from the craft and Captain Parmentier and the plane's First Officer took off for Melbourne. Even with the delay the plane took second place in the speed round and won the handicapped section outright. It was a great victory for the airline, country, and the a small Australian town. The first thing I want to tell you is that I am very grateful for all the things that the national broadcasting commission has done to make our landing last night possible at the racecourse in Albury. I also must express my thanks for the help I had from the Mayor of Albury and the population who were very helpful this morning to get our plane out of the mud and to make it possible for us to take off." The Mayor, Alfred Waugh, would eventually be awarded the Order of the Orange Nassau — a great honor — by Queen Wilhemina. Both the pilot and first officer were knighted. A relationship between the European country and Albury was formed and, when the Uiver crashed two months later killing all on board, a memorial was erected in Holland that was partially paid for by subscriptions taken up in Albury.